The dark leafy greens such as kale and dandelion greens, which are bitter and astringent, support good digestion and aid the kidney and liver in removing toxins from the body. They also provide the body with fiber and chlorophyll, both of which support the body’s natural detoxification efforts, and are low in calories, but high in nutrients. Spices aid detoxification primarily by stimulating digestion and improving circulation. This helps the body usher toxins out the door. Ginger, cayenne pepper, turmeric, and cinnamon are such spices to use in your diet and smoothies. Sweet fruits such as apple and pear are high in fiber, which aids proper digestion and toxin elimination. They also provide a sweet taste to balance things out. Citrus fruits such as lemon and lime also stimulate digestion and help the body detox. 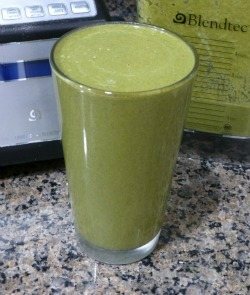 Besides consuming this smoothie, eat more foods that are spicy, bitter, and astringent, avoid heavier foods, and do some juicing to further your detox efforts. Note, this can be a little strong for newbies, therefore reduce the amount of leafy greens and possibly the spices if that’s you. Enjoy! I’d love to know if you tried this spring detox smoothie or have your own favorite detox recipes or protocols – please do tell in the comments below. Happy Blending! I loved the Spring Detox Smoothie! The cayenne pepper in it was great! This is a smoothie to love, isn’t it? :) Thanks for sharing and glad you enjoyed it. Is there an “alternative” for the dandelion greens? I’m having trouble locating them at any of my local grocery stores. I guess that is what happens when you live in a small town? Hi David, the next best things to substitute for dandelion greens are kale and arugula. If you’re up to it you could harvest your own dandelion greens :) Cheers! I really enjoy these smoothie recipes and info on them..thank you so much! Are the add on’s necessary or just a suggestion? The add-ons are suggestions or optional ingredients to bolster nutrition and taste. Yousa! This thing was spicy! But good! Glad to hear that it’s good for me. I grew the kale, parsley and habanero pepper, so they were all organic. I might do this every day. Great minds think alike, Joyce :) Love the habanero pepper to spice things up and you can’t go wrong with turmeric. Kudos for growing your own organic ingredients. Hi Ryan my name is Patricia. Your website is awesome and you provide us with a wealth of FREE information that I am most grateful for. I can’t remember if you mentioned this already but can we drink smoothies anytime? Also is there a smoothie that may help witj Sleep Apnea and High Blood Pressure? I apologize if you already have this information available but with the Sleep when I’m reading I fall asleep and/or sometimes forget what I have read and it would really help me out if you don’t mind repeating it and I will have this one spot to come back to. I know God blesses you daily because you have shared the knowledge He gave you with all of us straight from your heart. Again I THANK YOU! Yes, you can consume smoothies anytime of the day. However, do so on an empty stomach to maximize digestion and nutrient absorption. I don’t have a smoothie for sleep apnea. I can add that to my list and potentially address in the future. Stay tuned for an article on high blood pressure coming out later this month.